Rewarding people without destroying their motivation has been one of the top management challenges in companies employing knowledge workers. Unfortunately, the reward systems used by these organizations incentivize recognition through imaginary performance rather than real merits, causing an extremely negative impact on employee motivation. Daniel Pink, one of the current greatest researchers on motivation, stresses in his book Drive: The Surprising Truth About What Motivates Us the importance of focusing on factors such as purpose, mastery and autonomy to stimulate people’s intrinsic motivations, without losing, however, the guideline that a fair salary and a reward system that fosters employee development remains important in meeting the needs of our extrinsic motivators. Salaries should always be expected. Bonuses shouldn’t be. Always keep bonuses as a surprise. When bonuses become frequent and anticipated, they ought to be converted to regular salaries. Earnings should be based on collaboration, not competition. When determining how much people should earn, the main criteria should be their collaborative work toward a common goal. Peer feedback is the main performance measurement. Contributions to a shared purpose are best detected and evaluated by peers, not by managers. Only the whole system knows all the details. Creative thinking can grow the compensation system (not rig it.). Expect that people can (and will) game any system, and tap into that creativity by inviting and supporting it, instead of driving it out. Compensation can be used to nurture intrinsic motivation. Make money a reflection of people’s curiosity, honor, acceptance, mastery, and all other intrinsic motivators. Based on these factors, Jurgen created the Merit Money, a collaborative and continuous bonus system model that encourages support and recognition with focus on actions and behaviors that really contribute to the improvement of the team as a whole. The main idea in this model is to create a secure environment based on mutual trust among team members, empowering them to share the responsibility of rewarding the work of their teammates and doing so at their own discretion. 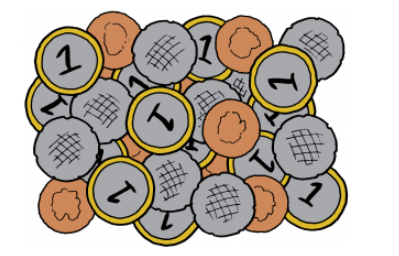 The Merit Money practice consists in the creation of a fictitious currency, which allows the point accumulation. Periodically, each team member will receive an equal number of points, which must be distributed, completely and publicly, to other team members according to their contributions importance. It is very important that this recurrence is not so short as to not give time to generate contributions, nor so long that people do not remember what happened. In this way, each team member will have the accumulation of credits that, in random periods, can be converted into real money according to a previously agreed conversion rate. 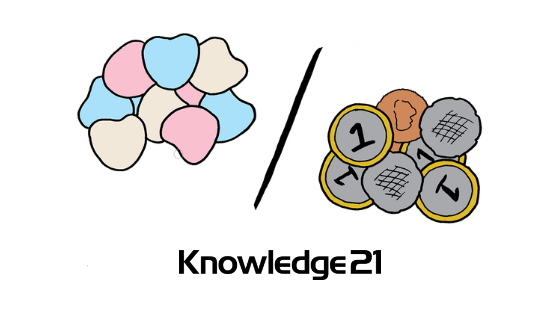 As a company that believes in experimentation and provides a safe environment for us to validate our hypothesis, Knowledge21 has decided to bring the Merit Money practice in-house, enabling our Agile Coaches team to experience its use to draw their own conclusions. For nine months, from April to December 2017, the amount of 1,000 meritecas was deposited each month in the “account” of each coach so that we could distribute them within our team in whatever way we thought was the fairest. The only restriction was that no meriteca deposited by the company could remain in the coach’s account, all should be distributed. Each transaction was documented in a “donor, value and justification” format and we used a one-to-one conversion rate, where each meriteca corresponded to R$1.00 (Brazilian Reais) which should be redeemed after disclosure of the result. Initially, we adopted a format where there was only one person responsible for consolidating all transactions and sending to each coach only those referring to his account. In the very first rounds, we felt the impact of centralization, as our schedules were full, and we decided to let any member of the team pull that responsibility. After a new short period of time, we implemented a second improvement. We made all of the transactions carried out by the team public. Because we are geographically distributed throughout Brazil, after each cycle the results were shared in a Google Drive spreadsheet, allowing each coach to visualize the details of every transaction made on his account as well as on accounts of the others in a transparent way. The model is a great way to incentivize the culture of positive feedbacks and recognition of good work done. Autonomy added to the collective intelligence of the group avoided abuse and mitigated injustices. We improved our systemic vision as all coaches began to look at the work of the whole team to provide feedback. It reinforced aspects such as that of those who are more socially has more visibility, strengthening the culture of exposing the work done for the whole team. It evidenced the maturity of the team: deciding to make values and feedbacks open for the whole group, strengthening a safe work environment and mutual aid. If you have a fair salary, where no one bothers you how much you earn monthly, a variable bonus system will hardly bring negative consequences. In a system composed of knowledge workers, it is possible to generate healthy peer pressure and self-organization using extrinsic factors. The culture can be positively shaped, following #TrueAgile values even with some money being used as fuel. Evaluating behavior rather than outcome has immense value because it helps create a collaborative culture rather than self-serving behavior. The model application allows exposing pains that are often hidden from our daily routines, allowing the company culture to have great opportunities for improvement. There is nothing more powerful than the “behavior drives results” to design exponential organizations and high-performance teams. The right behavior brings the result that the company needs. This was one of our reward experiments. Would you like to do something similar? What are you using in your company? Tell us more in the comments.